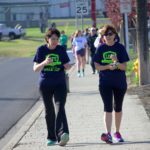 Our Walk for Life on April 22, 2017, was fabulous! Thank you to all of our walkers, sponsors, church liaisons, underwriters, and prayer warriors that made this possible! With your help, we raised nearly $40,000 for LIFE!! !